Diigo? Yes! 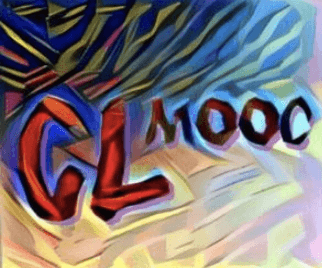 It means “Digest of Internet Information, Groups and Other stuff.” It is a powerful tool that aids in serious research and annotation of the web. Whenever I’m conducting important research, this is my go-to tool in order to annotate and organize my notes. I often save both to Evernote and Diigo, but Diigo allows me to annotate directly on the webpage. 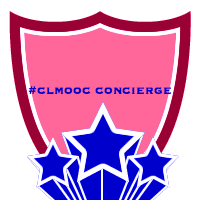 My library is fully searchable and saves all my highlights and annotations together in tagged lists, outliners, and/or collaborative groups. 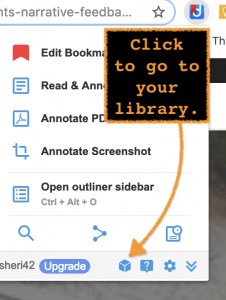 The video does not explain how to import your Kindle notes or use the Outliner once the websites have been saved and annotated [Outliner info and navigation]. From the Outliner info is this gif on how easy it is to drag and drop from your library or an article to your outliner. 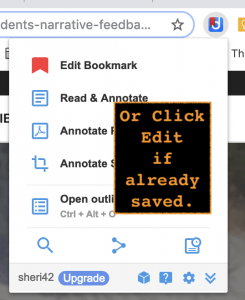 Click the Diigo extension icon to “Save Bookmark” or “Edit Bookmark” if already saved. A pop up will allow you to add description and tags, choose list or outliner, choose group and SAVE. Back on the webpage, click and drag anywhere you want to highlight important points to get the highlighter [left icon below]. 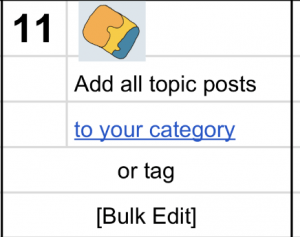 On the webpage, place cursor in highlighted area to choose the middle icon to add a sticky note. Add the notes/ annotation / summary to the note and click save. I keep my notes private. The note will look like this on the webpage. 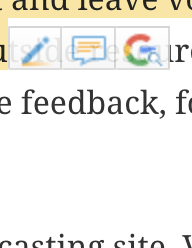 Hover over the “note” icon to view the note. 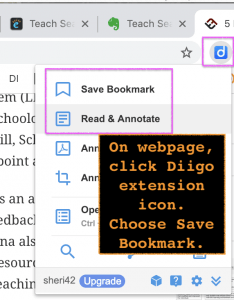 Click the Diigo Extension and the library icon to go to your library. 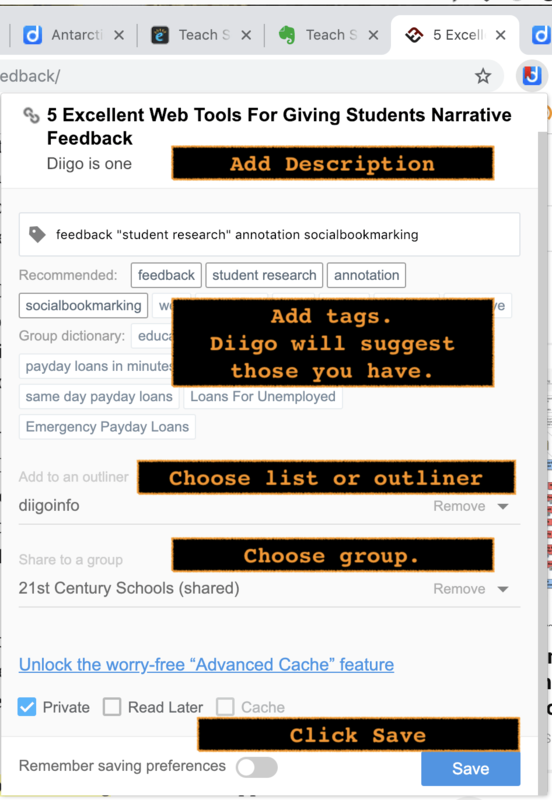 As you can see, Diigo captures your highlights and notes in a searchable and organizable format in your library. It also takes a snapshot of the webpage so you can view it. 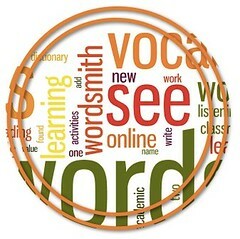 This is a powerful tool that I find is one I use for those bookmarks I need for extended curation. 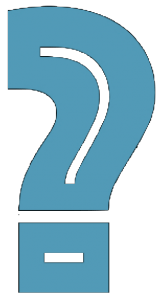 What’s your annotation and bookmark tool? 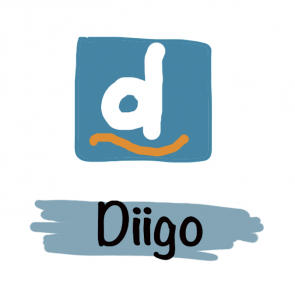 How do you use Diigo?